This is a very simple question. Trump Jr. recently disclosed emails suggesting he welcomed Russian help against Clinton (see for instance here and here). To a considerable extent, this seems a damaging move to him and to much of the team he is working with. As far as I understand, this is pretty much political self-harm. Why would he do such a thing? How does this move serve his interest? Trump Jr. tweeted that he was releasing the emails to be "totally transparent," but his release came moments before The New York Times published the content of the emails. The only options for Donald Trump Jr. would be to deny it or try to accept that the mails were going to be public and working on that assumption. Refuse to answer (use the 5th Ammendment). Lie under oath and risk perjury charges. '#1 and #2 lead to admit (explicitly or implicitly) that the e-mails are indeed true. So, (if we discard #3) claiming that the emails are false it would only lead to Trump Jr. being forced to rectify, only that at a later time (during which the issue would not be forgotten) and with yet more damage to his credibility. By releasing the e-mail he may (attempt to) claim that he was "not hiding anything" and try to get as much of a positive spin2 from it as possible, under the current circumstances. For example, his release in twitter was accompanied by affirmations that what he did was ok and which (despite no legal expert agreeing with that) are already being repeated by his supporters. It takes away the spotlight from the New York Times article that would (most probably) be very critical of the situation described in the emails. This allows the emails to be presented to the public through some news organizations that are known to justify everything the Trump government does and dismiss any criticism of it, no matter what. It "steals" the New York Times part of the publicity/brand recognition it would have got for the publication of the emails. 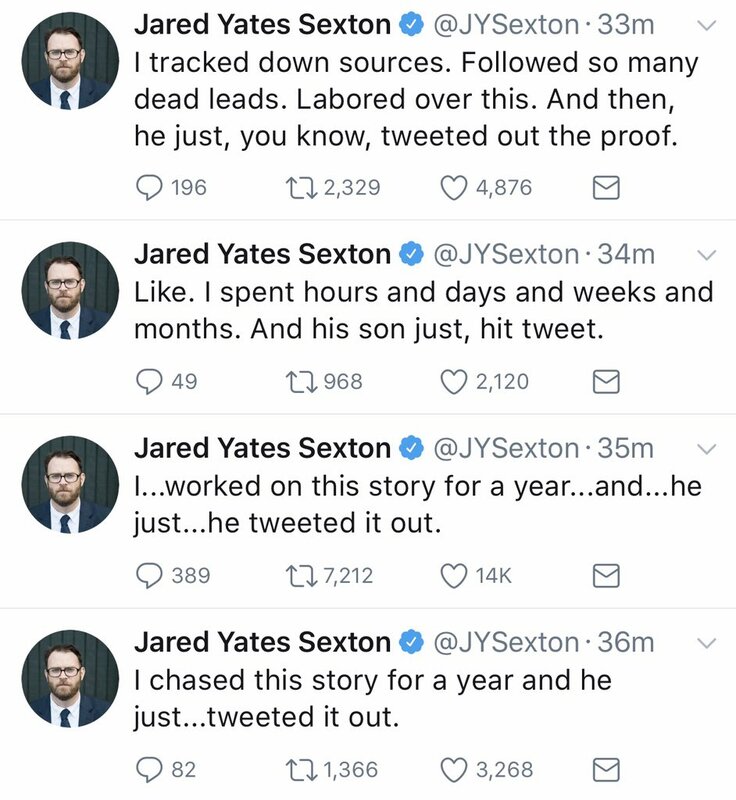 1If such a story goes as far as to being published, it is reasonable to assume that the journalist has evidence enough to prove that the emails are indeed Donald Trump Jr.'s. 2This is usually called controlling the narrative. It's reported that The New York Times already had gotten the emails and Trump Jr. published the emails to preempt their publication.
.@DonaldJTrumpJr posted these emails after being informed that The New York Times was doing a story on them. Basically, by doing this, it will allow him to claim that he is transparent with the meeting which is the reason he mentioned on Twitter when he released the emails. He stated that he wants to be "totally transparent" and that is the reason he released the full chain of emails, as seen below. The White House spokesperson also read a short statement from Trump that emphasised on Trump Jr.'s "transparency". I’ve got a quick statement that I will read from the President: "My son is a high-quality person and I applaud his transparency." In this case, it is more advantageous for him to publish the emails himself since he can claim he is transparent. By letting the NYT publish it, he won't be able to do that but the contents of the email are still revealed. So, in this circumstance, it is a better move for him to do that. It was a way to deny the New York Times a scoop. When a news outlet gets a story like this you have to do a lot of investigative journalism to validate and verify your sources. If you've managed to keep it quiet, your paper stands to make a lot of money because you are now the source for all of this information. This isn't actually a political question; it's more a social one. It's human nature to give somebody a bit of a reprieve for owning up to their mistakes; you look a lot worse if you insist upon your innocence right up until the time that somebody proves you are lying. Think of it like a plea deal with the public — I'll come clean to you now, before the media rats me out, and you give me a little bit of credit for that. It's an attempt to gain sympathy by being honest, even though in truth it's an entirely self-serving maneuver. Since a meeting like this is not illegal or unusual, the best way to respond is to be transparent and play open card. This will prevent further rumours and accusations and remove the opportunity for media outlets to exploit the situation by releasing small bits of information over a long period of time in order to get ratings. Not the answer you're looking for? Browse other questions tagged united-states president justice or ask your own question. Why is it a problem for Trump Jr to have met with Russians? Where do I find the campaign trail for Donald Trump? How could Trump leave office?